We can construct a beautiful fractal set by defining an operation of iterating exponentials and applying it to the numbers in the complex plane. The operation is tetration and the fractal is called the power tower fractal or sometimes the tetration fractal. A detail of the set is shown in the figure here. Detail of the power tower fractal. 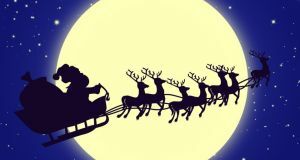 The article in this week’s That’s Maths column in the Irish Times ( TM035 ) is about the remarkable Christmas Eve journey of Santa Claus. Reports of the length of Ireland’s coastline vary widely. The World Factbook of the Central Intelligence Agency gives a length of 1448 km. The Ordnance Survey of Ireland has a value of 3,171 km (http://www.osi.ie). The World Resources Institute, using data from the United States Defense Mapping Agency, gives 6,347km (see Wikipedia article ).